After breaking the grey city limits of Hanoi, you begin to pass through the rain soaked fields of green vegetables destined for the urban tables of the Vietnamese capital. The brooding clouds contrast with the verdant fields, but the oppressive sky adds a bleakness to the atmosphere. Crossing a checkpoint, the road begins to become more rustic. After an hour or so of bumping along the putted and rutted dirt road, you come to a small town called Bến Đục on the Yen Vi Stream. Getting out of the minibus that has brought you this far, you shake the cramps out of your limbs before the next leg of your journey. The five minute respite has given you enough time for a glass of green tea at the roadside tea stand amongst the locals who are smoking thuốc lào (farmer’s tobacco smoked through a bamboo pipe). You are called to the river and see the vessel that will take you to your terminus. You get aboard the small boat and your trip through the stunning Vietnamese karsts begins. The ancient boat-woman uses the sheer brute strength of her legs and, sometimes, arms to push and pull the oars. The clouds open and the sun shines down on you as if the place you are entering is blessed. 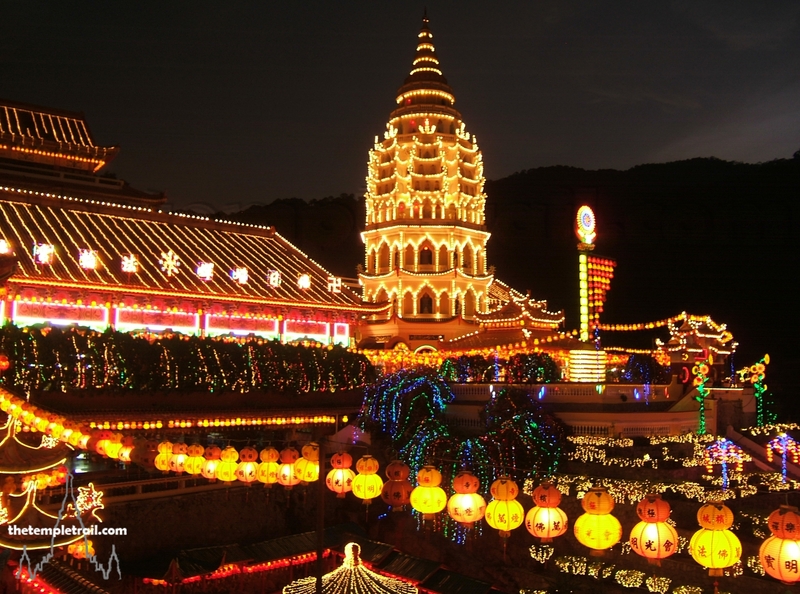 Metre by metre, you get closer to the famed Chùa Hương; the Perfume Pagoda. The pagoda is actually a large complex with several temples within it. 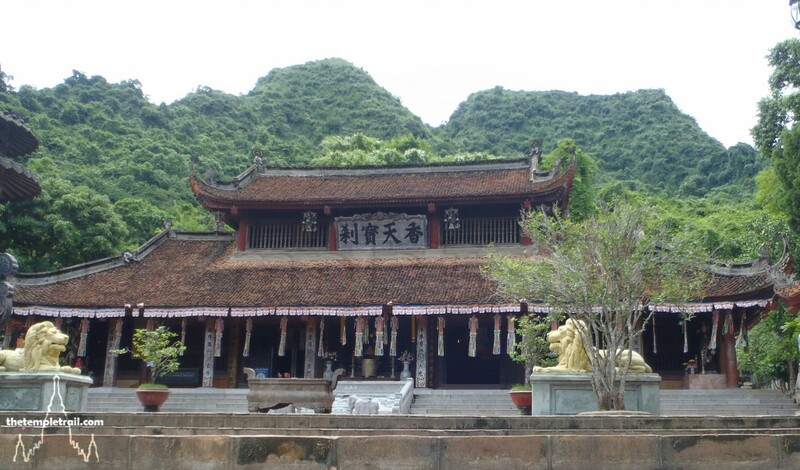 Founded in the 15th century, it sits among the beautiful jungle covered Hương Tích Mountains. The temple complex has seen destruction and repair a number of times and many structures were replaced in the 1980s and 90s. It has been a pilgrimage site since its foundation, but its magical properties are fabled to have been discovered 2000 years ago by a wandering monk. Many Vietnamese people believe that Buddha washed himself in the river here and they come to wash away their bad karma. Traveling along the river in your iron boat, you take in the scenery that seems so alien. The floodplain of the river is punctuated by sharp limestone karsts that jut out of the flatness as though they were placed there. 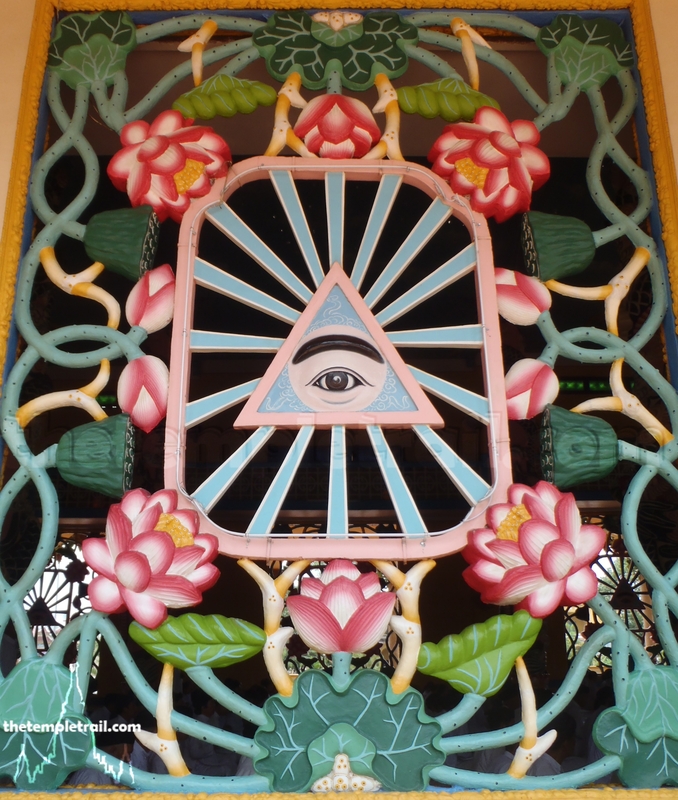 Before you can go to the main sanctuary, you must show yourself at Ðền Trình (presentation temple or registration shrine). 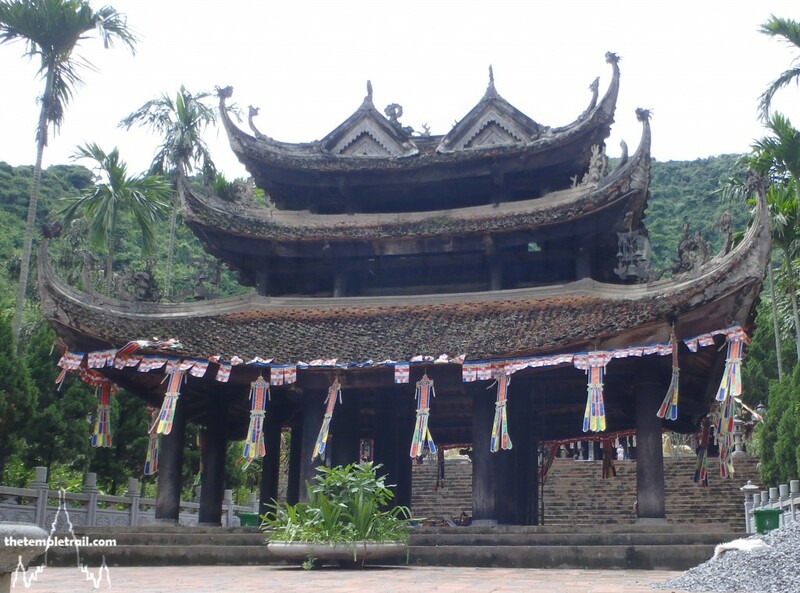 The name đền denotes a non-Buddhist temple and this one was built to honour an ancient general of the Hung dynasty. After registering with the gods, you get back on your boat and head toward the main area of the sanctuary. You finally disembark a little further downstream at the wharf and begin to ascend the shallow steps. Your climb brings you past an overgrown stele pavilion and under the cool shady canopy of the jungle that swathes the whole area. Passing through a gateway, you stop and have a cup of tea at the stands that have been set up to serve pilgrims. 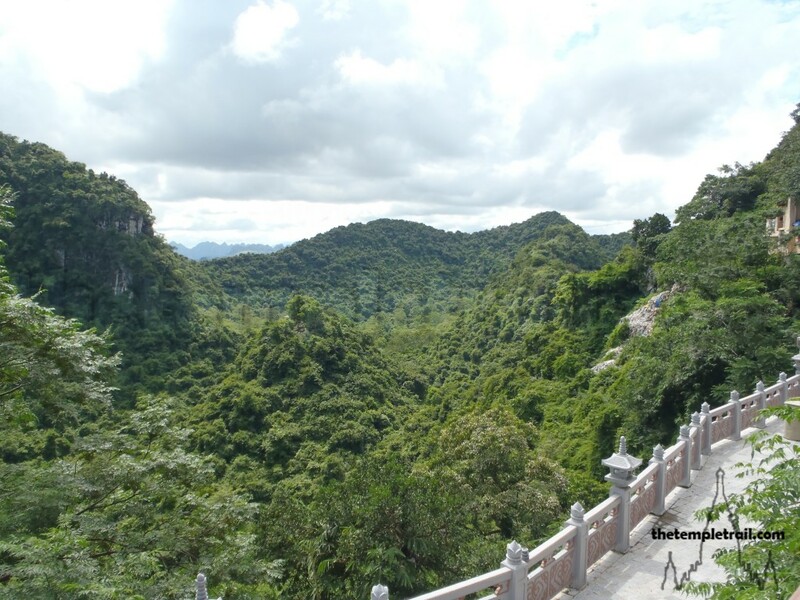 The refreshing green tea is practically free and after slaking your thirst, you climb the final set of steps to Chùa Thiên Trù; Heaven’s Kitchen Temple. The temple is named after the rock formations that resemble people working in a kitchen. As you walk up the steps and toward the main doors a pair of Thần Kim Cương (Diamond Gods) warn you that you are entering a sacred place. These statues are a common feature of Vietnamese, Chinese and Japanese temples and are a manifestation of the Bodhisattva Vajrapani, who represents Buddha’s power. The grimacing duo watch over the temple portal and beneath them are some offerings from Vietnamese devotees. 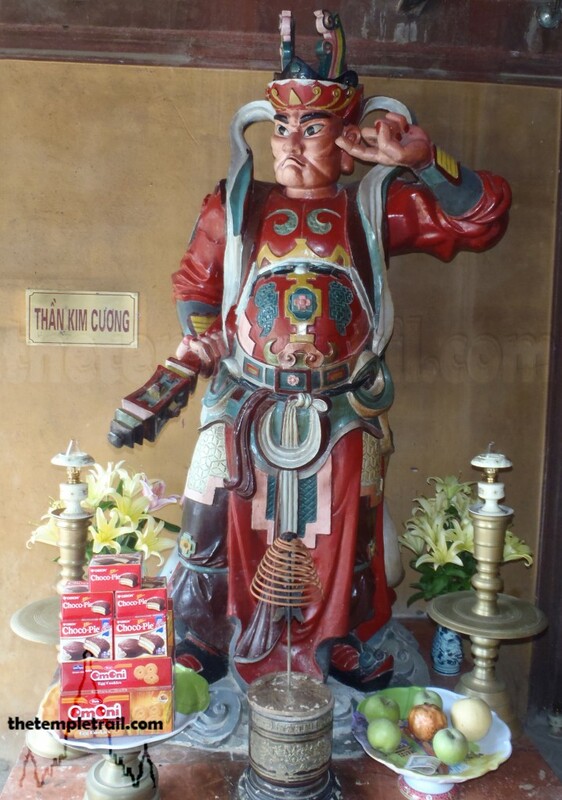 Among other statues inside the temple, is a beautiful golden faced wooden statue of Quan Âm (Guānyīn) who radiates her loving kindness to worshippers. After making your way further uphill, you have options. You could take the path to right and go to the Thiên Sơn Grotto and its interesting cave formations, or continue further and take the path to the left to the Giai Oan pagoda and its Natural Blue Pond. The best option for the weary and time constrained visitor is to cut out the hour and a half hike and take the cable car. The cable car takes you flying high up above the jungle and you feel lost in a sea of green. Higher and higher you go until at the top, you alight and survey the landscape. Taking a cliffside path that affords you stunning vistas of the dense forest blanketing the entire area, you eventually come to a shaded stairway that descends into the bowels of the earth. Within minutes on the 120 slippery steps, you arrive at the Dragon’s Mouth. This is the entrance to the large Động Hương Tích (Traces of Fragrance Grotto); ‘the first-ranking grotto under the Southern Sky’. You are swallowed by the earth as you drop into the darkness of the cavern. This is the holiest place in the complex and all around you are shrines to Buddha and other holy figures. The statues give of an eerie illuminated aura and the air tingles with energy. The shrines here are not the main points of worship however, not even the glorious green stone Avalokitesvara statue. 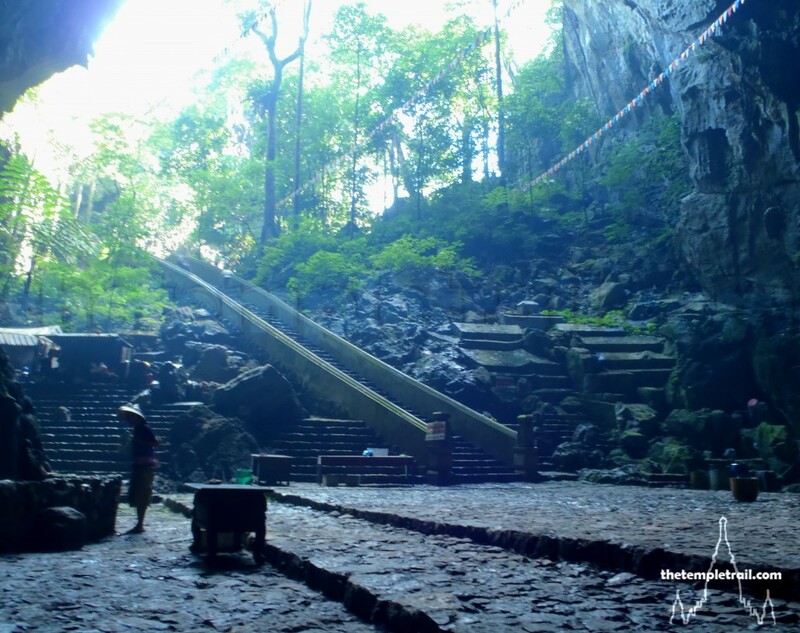 This cave, which was probably used by animistic worshippers for centuries before the Buddhist faith spread to Vietnam, is special for its stalactites and stalagmites. They have names and are the focus of devotion. Those seeking fortune worship the Heap of Coins or the Gold Tree. If you want health, you would be directed to the breast shaped stalactite to catch some of the heavenly milk that drips from it. Children can be obtained by praying at the Girl or the Boy. The grotto is a maze of altars and rock formations and the chanting that reverberates from its nooks and crannies echoes in your ears. The cave amplifies the adoration of the devotees and it feels much more primeval than most Buddhist grottoes. The animist roots shine through and the underlying Vietnamese folk religion is more than apparent here. Walking back out of the Dragon’s Mouth, you are blinded by the shafts of light that penetrate the jungle canopy. If you had time, you could complete the holy route and climb to the top of the mountain on the foot worn steps. You opt to descend and once more you fly over the forested landscape. You have been into the heavens and into the belly of the mountain, you come back refreshed and spiritually cleansed. As you head back to your boat, you bid farewell to the magical place that washes away bad karma. Your slate has been wiped clean and you are ready to head back to the carnage of Hanoi, having taken in the serenity of the Perfume Pagoda.